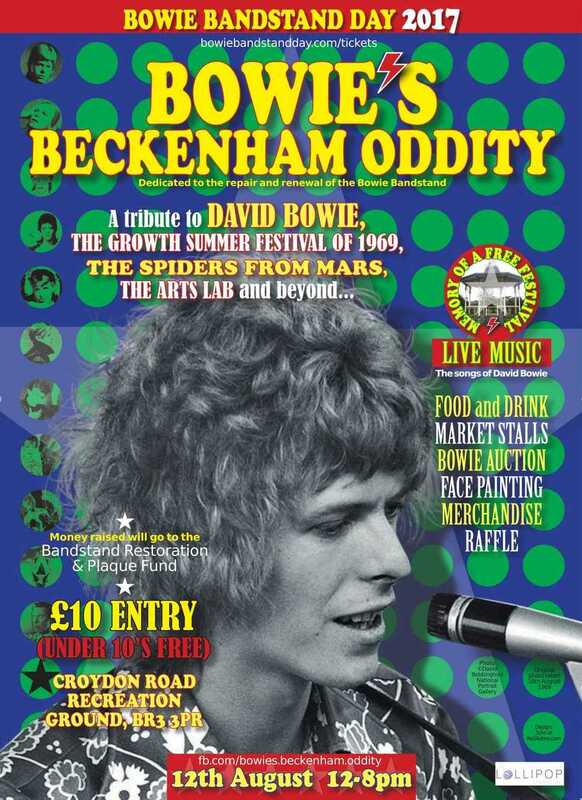 BOWIE’S BECKENHAM ODDITY is an annual fundraiser, supported by David Bowie when he provided signed items for auction at the event. This year the Bowie Archive has donated another item signed by him, more details of which will follow before the festival in August. Money raised goes to the Bandstand Restoration & Plaque Fund. In 1969 a young curly haired man who went by the name of David Bowie co-organised a festival at Croydon Road Recreation Ground, South London. He even later went on to immortalise that day in his song ‘Memory Of A Free Festival’, which also appeared on his Space Oddity album. Bowie fans worldwide – join us in celebrating the life and musical legacy of David Bowie, The Growth Summer Festival of 1969, The Arts Lab, The Spiders From Mars and beyond…. Tickets are £10 (under 10’s free) and all money raised will go to the Bandstand Restoration and Plaque Fund. At last year’s event Bowie fans united from around the world and helped raise over £17,250 for the project. The Edwardian bandstand in Beckenham (now named the Bowie Bandstand), will always be the ideal place to honour his memory (especially in the Beckenham/Bromley area), as well as being an important part of local history. “Aylesbury will soon have a Bowie statue as a lasting tribute to the great man, Brixton also has its mural. And so we need the Bowie Bandstand in Beckenham fully restored in his honour and for all the other musicians that performed at that original event of 1969.